Laurent Gauthier was born in 1965 on the Cote du Py Hill. His parents were also growers. He estate has existed since 1834. After his studies at BEPAVigne et Vin in 1983, he started is own estate with only 2.5ha. Then in 1991, he took over the estate of his father and now his son, Jason is working in the vines. Laurent is very demanding in the vineyard and being a perfectionist, he is very proud of his wines. Laurent currently owns 2ha of vines on the famous Cote du Py in Morgon, with a southern exposure and a soil made of blue granite and manganese. The terroir from Morgon is renowned worldwide and Laurent is proud to be able to work with these vines. Paradoxically, on this magic terroir, winemaking is very easy, the wine is almost made by itself. 16 days maceration on average in gridded tanks with full grapes. Putting wooden gridds on each tanks in order to maintain the cap down and to favour the immersion of the cap in the tank. He is practising only two remontages : pumping the juice over at the begining of the maceration and then that’s it. Just waiting the right time to press the grapes. After the malolactic fermentation is taking place in wooden vats and the ageing will last at least nine months. Beside Cote du Py, he has 9 ha on the Grands Crase located on the south of Morgon. The soil here is made of rotten rocks (schist) giving every year to the wine mineral and smoky notes. Characterized with a south, south east exposure and light slopes. The winemaking of Grands Crase is more complex and need a good knowledge of each origin and plot of vines. Sometimes distemming the grapes (between 30 and 80%), it depends on the conditions of the year. The maceration is lasting between 10 and 15 days in gridded tanks with temperature controlled under 25°c. After eight days, doing a delestage and then two pigeages before pressing the grapes. The vines are plowed two times a year (by the spring and fall). And for five years now, some of my vines (4 ha) under grass in order to limit the yields (average around 50 hl/ha), to limit the use of chemicals and to favour the biodiversity in my vines. The wines age very well thanks to the specificity of my terroirs and can age up to 10 or 20 years. An iron hand in a velvet glove to produce this Rosé wine full of nostalgia: happy times to be shared between family and friends. Perfect with chicken skewers, grilled meat, BBQ, charcuterie and cheese. Deep garnet red robe. Very complex wine, powerful and fleshy, with kirsh, blonde tobacco, blackcurrant and mineral notes. 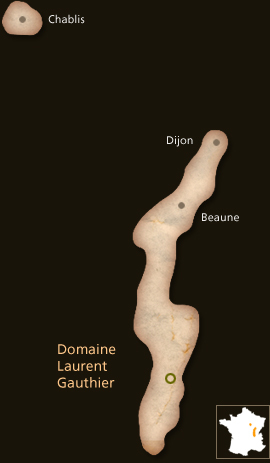 The nose is marked by the specificities of the terroir more than just by the fruit. With more edge, the wine is showing candied strawberries and griottes notes. The finish is very velvety and persistent. Intense and Burgundian as a Pinot Noir! Winemaking: Vatting for 14 days in gridded tanks – temperatures controlled between 28° and 30°C – aged for 9 months in oak barrels – bottled on the estate in prestige Burgundy bottles and natural corks. In the Jancis ROBINSON online review for the COTE DU PY 2009 Comments: « Deep crimson. Opulent and very ripe. Polished tannins. A Musigny? Lots of stuffing. Very serious. But plumper and more obviously seductive than the Grands Cras”.